What is the motorable route? In case I want to opt for public transport? How long is the trek? How is the trek route like? Do I need a guide? Where to stay and how much will it cost? Kalpeshwar (2,200 metres, approximately) is a Hindu temple dedicated to Lord Shiva located in the Chamoli district of Uttarakhand. It is the Fifth Kedar to be visited, in case you are staying true to the sequence of the Panch Kedar circuit. The other four being Kedarnath, Madhmaheshwar, Tungnath, and Rudranath. It is also the only one (of the five temples) that stays open throughout the year. The rest close down for the winter a day or two after the festival of Diwali. Earlier, the trek to Kalpeshwar started from Lyari as the road till Devgram was still under construction. Now, I’m told, the road has been completed although it’s not a firm one and not always open. The road from Haridwar to Helang is more or less well-maintained except for a few patches that fall under the landslide zone. But it is not going to be a cakewalk driving from Helang to Devgram. It is not a road but a trail of loose (mostly) soil and rocks that is prone to breaking apart. It is advised that you keep driving till Joshimath (14 kilometres from Helang), park your vehicle there and then take a shared jeep to Devgram via Helang. Unless you are a pro at off-roading! This more than sorts it out in case you are driving your own vehicle or a self-drive vehicle. Please note that almost all of the taxis to Devgram ply from Joshimath and aren’t as frequent as to other popular places. You might have to wait it out at Helang. Alternatively, you can get down at Joshimath and stay there for the night. Next morning, take a shared taxi from Joshimath to Devgram. If you don’t like to wait it out and have money to spare, you can book the entire vehicle (from Joshimath) at around INR 500-600 for one way. Buses, both local and of Uttarakhand State Transport, and shared taxis start plying from Haridwar/Rishikesh to Rudraprayag and further as early as 4 am. It should cost one person INR 1200-1400, Haridwar to Haridwar. The trek from Lyari to Kalpeshwar is barely 2 km, whereas from Devgram to Kalpeshwar it is less than 500 m and pretty straight forward, passing through the gorgeous Urgam Valley. Most of the route is paved with little to no ascent. Reach till the end of the village, a curve from where the path descends towards the river. 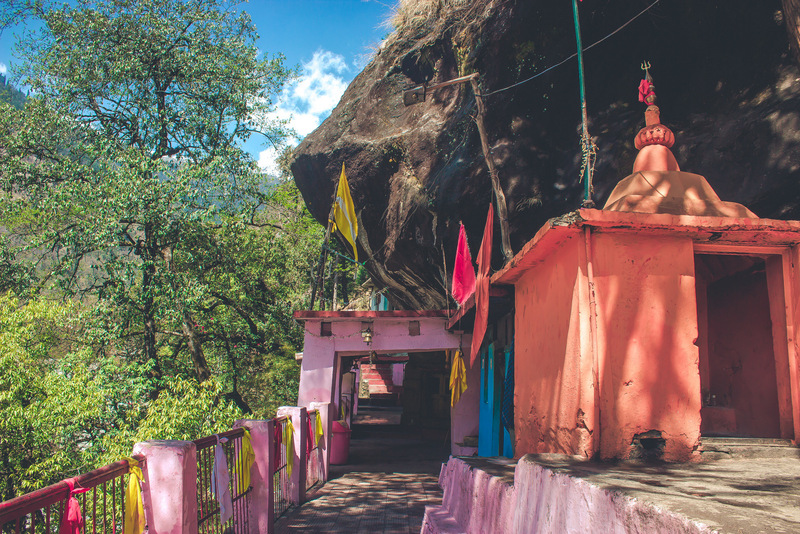 You will see a short ascent on the other side of the river, left to the waterfall, and leading up to Kalpeshwar temple, neatly hidden between the rocks. Walk down and take the little wooden bridge to reach to the other side. If you start early, you can make it back to Joshimath by afternoon quite easily. You do not need a guide. Dhyan Badri Temple on the way to Kalpeshwar. There are a decent number of guest houses and lodges in Devgram where you can get a room for about INR 300-400 for two. The vibe here is inherently different than rest of the four Kedar combined. Even though the trek is short-lived, Urgam Valley makes it up with its chilled-out demeanour and ever-so-smiling locals. If you wish to come back to Joshimath the same day, there are plenty of options, the cheapest one being the dormitory beds at GMVN, available for INR 300 per person. And if budget is not a constraint, you can also go for luxury cottages, and a few small guest houses and resorts at Auli, 25 km from Devgram. This is the gist of it. If you have any further queries, feel free to leave a comment below. I’ll get back to you as soon as I can. Stay safe, travel responsibly! Kalpeshwar Trek. That is how it looks for the most part. Dronagiri Peak as seen during the trek. Barmal Peak as seen during the trek. That’s pretty much all the info summed up. How many days would it take to complete the trip from Delhi-Kalpeshwar-Delhi? And what is the best time to visit? Hi. Thanks for writing in. It should take 3-4 days, Delhi-Kalpeshwar-Delhi. It is open through the year so depends on your preference. Personally, I’d recommend Oct-Nov. Also, there has been a correction. Request you to read it once before planning.